‘Fruit above medium size, roundish-obovate or turbinate. Skin of a beautiful lemon colour, very much covered with thin cinnamon-coloured russet. Eye small and open. Stalk inserted on the apex of the fruit without depression. Flesh very fine grained, buttery, melting, and very juicy, with a brisk piquant flavour, and fine aroma. 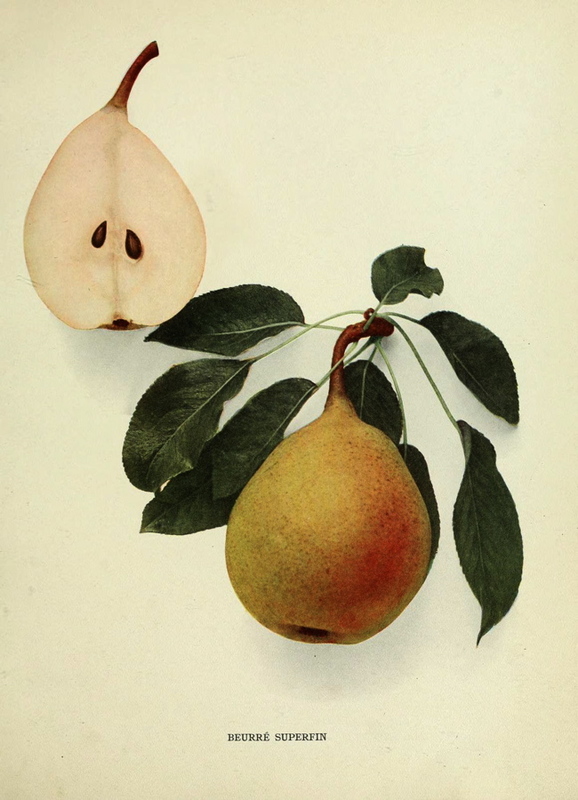 A first-rate dessert pear, ripe in the end of September and beginning of October.’ [Hogg – Fruit Manual p.185/1860]. ‘Beurre Superfin was raised from a bed of pear seeds made at Angers, France, by M. Goubault, a well-known pomologist, in 1837. The parent tree so produced bore fruit in 1844 and the Committee of the Horticultural Society of Maine-et-Loire was requested to report on its merits, which it did in that year, and M. Millet, president of the society, named it Beurré Superfin. It was introduced in America about 1850.’ [Pears of New York p.138]. 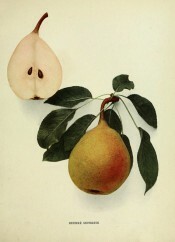 ‘A very fine dessert pear.’ [HP pl.XXII/1878]. Also figured in Le Jardin Fruitier du Muséum as ‘Groslin’ [JFM vol.4/1861]. Listed only in the 1857 catalogue in an Addendum as ‘Beurré superfine’. This is amended in Macarthur’s hand to ‘Beurré Superfin’ in a copy of the catalogue used by him for this purpose [Pear no.60/1857]. Listed in the diary but with no comment [Diary B, MP A2951/1862]. Obtained from Veitch’s Nursery, probably the original Exeter premises.